Flint's convert team of special operatives has assembled and is about to embark on their first mission: extract information from the former Cobra Commander's son. Meanwhile, two deadly assassins, Firefly and Blacklight, cross paths on the way to that same location. Costa is giving us exactly the type of Joe stories I want: small teams of covert special operatives globe-trotting to bring down an organization that is bigger, rich, and more devious than they are. Through Flint, Costa has assembled an unlikely team: Firewall, Chameleon, Lady Jaye, and Ronin. None of those would have been my top twenty choices, but all are characters that Costa has been developing for the better part of his run, and all are unarguably strong and interesting characters. It's worth noting that there are mostly women on Flint's team, but even more noteworthy is that no big deal is being made of it (which is the way it should be). Flint's Angels is undoubtedly the most intriguing thing going on in the Joe books currently. One of the most surprising events in this book is Costa's reintroduction of Firefly into the mainstream IDW books. 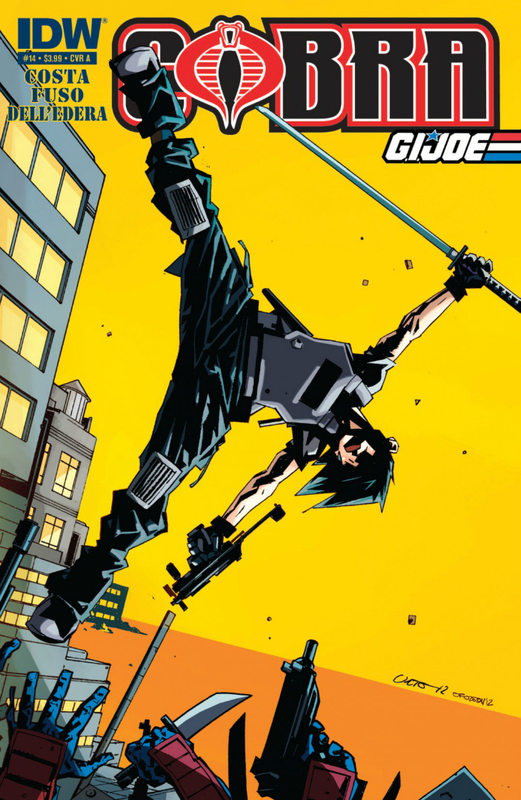 Max Brooks gave him a short, but outstanding, introduction in his Hearts & Minds series, emphasizing the assassin extraordinaire and ignoring the ninja-fication that dominated his appearances in the second half of the Marvel series. Since Brooks' series, though, Firefly (a favorite of many Joe fans) has been conspicuously absent. Part of Firefly niche had been filled by Blacklight, so it was especially fitting to see them "get along famously" when we first see them together. Antonio Fuso shares art duties with Werther Dell'Edera this month, which is a great matchup. Dell'Edera is a very talented artist who tweaks his style to match the mood of the books he works on. In general, however, his work tends to be dark and angular, much like Fuso's work throughout the Cobra series. Having Fuso off for several issues during the Cobra Command crossover emphasizes just how important his signature style is in establishing the tone of the series. "I defend democracy, Chameleon, but I don't operate one." Interesting characters, intriguing plot, and promises that it's only going to get better. Costa's got another winner on his hands. Recommended.